Everybody loves a freebie, right? If you want free samples and products from the big companies around the world, the only thing you need to do is just ask them. In fact, just write an email or letter to these companies and they will often send you free samples and coupons – no surveys or other gimmicks. Even though most people think that they have to participate in dodgy surveys to get such samples, it is usually not the case. In fact, you can get free stuff by directly asking the particular company. Most people are embarrassed to ask for free stuff from these companies thinking that the company might reject their requests. But there are plenty of companies that are prepared to give you free samples and full size products – in fact, they have so many products to give away, they will be glad that you asked them. You can sign up with companies that are searching for people to test their products. BzzAgent is a popular program where you can sign up for free products if you share your opinion on their products. I signed up in 2015 and have enjoyed receiving some pretty cool stuff. I enjoyed a Sonicare toothbrush, the dog was pleased with the Bella Dog food, and the whole family were happy about V8 juice, and Nescafe Caramel Lattes. You get invited to campaigns where you have to post on social media and write reviews about their products. The more active you are, the more campaigns you are invited to. 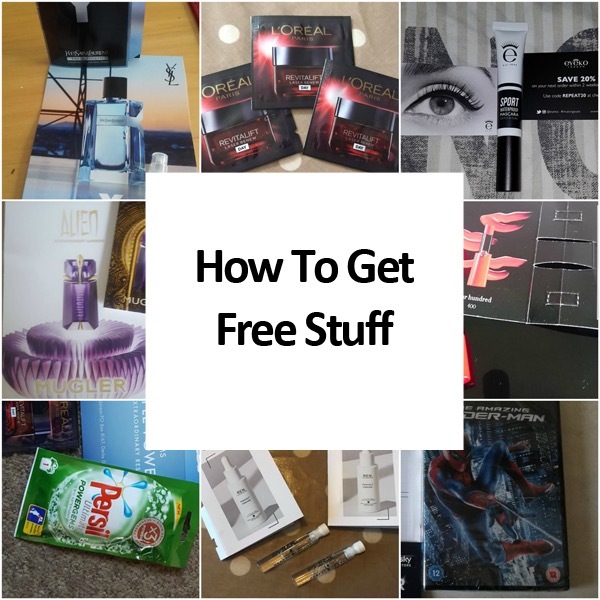 Although not everyone gets access to every freebie, you get more valuable stuff than most of the freebies available online if you qualify for their program. Sending feedback about their products to manufacturers is another effective method of getting free stuff. Whether you have a good or bad experience with the products of the manufacturer, you should let them know about it. This shopping tactic pays off big in the long run. In fact, out of the 26 companies that I have sent feedback to, 10 companies sent back coupons for free items. Some of these companies include Starbucks, Trader Joe’s, and Chipotle. There are many websites that allow you to fill out forms requesting free samples. Although these freebies are less valuable compared to the other two methods of getting free things, you should try this technique too. WOWFreeStuff is a company that updates their website with the latest lists of free stuff. They have a newsletter that sends freebie alerts to the subscribers. You have to fill a form to access this. Slickdeals Freebies Forum will help you find free digital products and magazines when you complete a survey. My last piece of advice should create a dedicated email address for freebies. This is because you will get continuous emails from the website/forums that you subscribe to – I would also advise against adding your phone number to any of the sign-ups. Let me know what freebies you find!